This is a long trail which involves a hike from the remote shepherd’s village of Dobёrdol to another less remote shepherd’s village in Kosovo (Milishevc). Milishevc has a good road connection with the city of Peja and more and more mountain huts in this village are being used for touristic purposes. For a less challenging hike, the trail can be separated into two parts. One can follow the eastern path at the junction (WP 3c) and descend to Bjeshka e Belegut where accommodation, camping possibilities and fresh food can be found at the shepherd’s summer huts. Bear in mind that there are no GPS waypoints from WP 3c to Bjeshka e Belegut, but the path remains easy to orientate. Bjeshka e Belegut is connected with Milishevc (WP 11c) by a dirt road easily identifiable with a map. 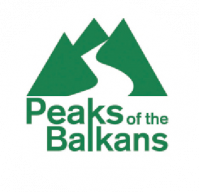 The hike starts at an altitude of 1741 m – mountain hut of Dobёrdol (WP 13b) – and climbs up northeast to the altitude of 2210 m at the border between Albania, Kosovo and Montenegro (WP 1c). It continues northeast with little ascents and descents along the border between Montenegro and Kosovo. At WP 2c, we turn right (north) at the junction. The path on our right leads to Babino Polje, Montenegro. Bear left (north) at the next junction (WP 3c). The east path leads to Bjeshka e Belegut. Our route follows the west side of Maja e Qenit (the peak in front of us, a few hundred meters from WP 3c). The west slope of Maja e Qenit is steep but short (approx. 500 m hiking) and is also the best option to get to the other side of this mountain (WP 4c) and head north to Roshkodolit pass (WP 5c). In case you find the passing of this mountain slope too difficult, consider following the path through Bjeshka e Belegut to Milishevc, which is a longer but easier option (mainly along dirt roads). 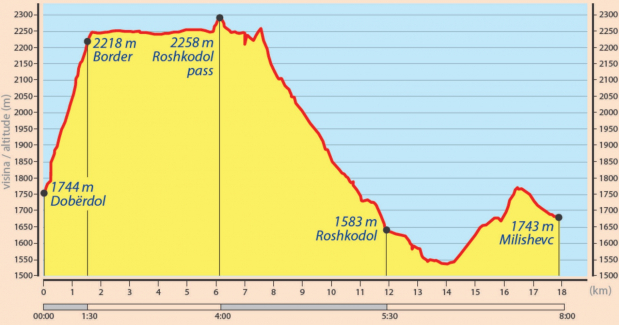 From Roshkodoli pass, the track descends and follows along the valley. At WP 6c we cross the river and continue along the track from the west side. We meet the gravel road at WP 7c, followed by the village of Roshkodol at WP 8c - an optional place for an overnight stay. Milishevc is located approx. 5 kilometers west of Roshkodol and is accessible by a dirt road. Bear left at WP 9c and 10c. This day hike finishes at Milishevc (WP 11c), where you can stay overnight at the village’s mountain huts.